Are you ready for Easter? We are! And we are going to show you some tips and ideas to spark up your Easter at home. You can still try to be green at Easter. A good example will be to reuse last year's Easter basket. 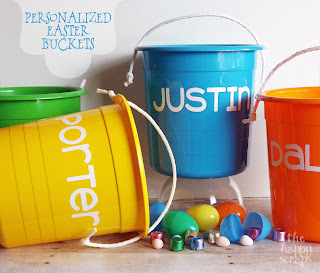 Or, if you have pails lying around, you can also make your own customized Easter buckets like these from 5 gallon buckets. At the time of festivities, you'll have more shopping bags than you normally do. Don't throw them away. Paper bags are no less good than plastic bags. A great idea is to reuse them as Easter masks as described here. There is nothing more memorable than having personalized Easter eggs. Especially if these eggs are looking back at you. Make your own photo print Easter eggs and have the whole family giggle. See instructions here. Then there are some projects that you can do with the kids. Like recycling these egg cartons or used cardboard boxes into cute button candies. Lori Marie from Pretty Little Things have all the instructions here. It's easy to do and will for sure occupy the children for a while. Got some old magazines lying around? You can either toss them away to the rubbish bin or create magazine mini baskets like shown below! Again, fun craft to do with kids on weekends. Click on the image for the instructions. It's Easter, get more eggs to the craft table! 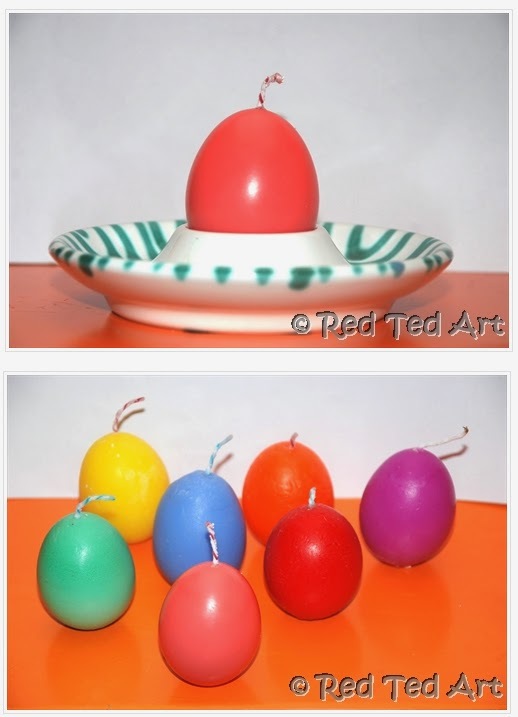 Red Ted Art has a wonderful idea of sparking up Easter with personalized egg candles. Here is a craft idea that works both for Easter and Christmas from Inner Child Fun: Easter Tree made from paper bag. Rather than having a paper bag ended up in the trash, why not create an Easter tree out of it? It's an easy project to do with kids and it's a lot of fun too. Perhaps add photo prints of your family to the little hanging things? Check here for instruction of watch the short video below. Another upcycling project that involves used plastic containers is this braided Easter egg. It takes just empty used plastic container and unused fabric from old t-shirts. Click on the image to go to the original website with full instruction. Used cardboard toilet paper rolls and cottons equal cute tube lamb!!! Make some of these to complete your Easter decorations. See instructions here. KidsKubby has tons of ideas of recycling toilet paper rolls, including the easy bird seeder below. Simply smear peanut butter on toilet paper roll, cover with bird seeds. Fun way to bring the children to the nature on Easter, or any other days.